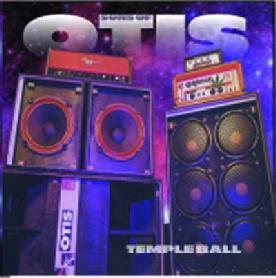 Sons Of Otis - "Temple Ball"
From Toronto, Sons Of Otis play bass heavy, doomy stoner rock with a psychedelic edge. The band's trademark sound is a slow and very sludgy stoner rhythm. And by sludgy I mean the thick black stuff at the bottom of the barrel. Very much a stoner version of the heavy 70's power trios like Robin Trower, Mountain, and the like. The songs on Temple Ball don't vary a whole lot. On the one hand, there's tracks like "Mile High", "Nothing", "Vitus", and "Super Typhoon", and "Steamroller" which are representative of the band's heavy driving doomy side that plows along like a train that may be moving very slowly but will still demolish anything in its path. There's little to distinguish the tracks from one another though we do get the occasional psych licks to make things more interesting, and "Super Typhoon" has quite a bit more head bangin' oomph than the others. They also do a cover of Mountain's "Mississippi Queen" which is pretty good though I don't like the Sons' vocalist at all. The two tracks that really grabbed my attention are "Windows Jam" and "New Diesel". On "Windows Jam" we really start to cook. The first two links on the Sons Of Otis web site are to Jimi Hendrix and Robin Trower and the guitar certainly nods in the Trower direction on this tune. The guitar sings a nice bluesy, but still stoner crunchy melody. There's no flash to the licks but they feel great, and at 10 minutes the tune has plenty of room to stretch out, though it doesn't develop a whole lot. "New Diesel" features a cool, slow soloing, bluesy psych guitar. Back into Trower mode, though not as overtly as on "Windows Jam". Rather, it has more of a Trower playing guitar for Black Sabbath feel. The whole thing has a 70's heavy trio rock sensation and the guitar plays with more emotion than I've heard of the previous tracks. Thankfully it's all instrumental as the vocals would have killed it. In summary, the Sons Of Otis play decent enough Stoner rock, though they seem undecided as to whether they want to be a doom band or a 70's power trio influenced band. Personally, I think they're stronger when they do the later with the heavy stoner bottom end. I'll bet they rock hard live though. You can visit Sons Of Otis at their web site.